My Rating: amusing, amazing illustrations to go with a delightful story. Love it! I don’t remember how I was introduced to Otter, but I’m glad I found her and Otter Keeper because I always enjoy reading about what new antics have occurred. The best news yet is this book: I AM OTTER. I had to pre-order and be patient, but when it arrived it was certainly worth the wait. I AM OTTER by Sam Garton is a gorgeous book! Sam is both the author and the illustrator, and he certainly has found his voice and artistic talent. Otter has attitude and determination which come across in amusing mishaps. The detail worked into each illustrated page is amazing and entertaining. Small spoiler alert … enough to tempt you: Because Otter Keeper, no matter how much Otter tries to prevent it, goes to work every Monday, and Otter and Teddy don’t have jobs, they decided to open a toast restaurant. Unfortunately, they immediately ran into problems. Here’s an excerpt: Next, Teddy hadn’t told anyone how much our toast would cost. As a result, no one brought any spending money, which led to some embarrassing situations. Finally, Teddy got several of the toast orders wrong. Some of the customers complained and had to be asked to leave the restaurant. The customers are toys from Otter’s toy box, and the illustration is of a few toys having been escorted (tossed) out the window. Too cute! There are such pleasing and amusing surprises to this story, I laughed out loud. When my grandson was here for a short visit the day my book arrived, he and I enjoyed reading I AM OTTER together. Every page has so much to see, and the situations created are truly funny. I love books like this. 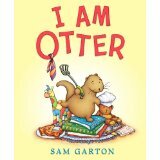 Check out this book trailer and get a taste of I AM OTTER by Sam Garton. You can find I AM OTTER listed on my BUY THE BOOK! page. This entry was posted in Mostly About Reading, Reviews & Interviews and tagged author illustrator, Balzer + Bray, Book review, book trailer, I am Otter, I am Otter blog, mischief, Otter Keeper, Picture book, Sam Garton. Bookmark the permalink. Sounds so cute. Thanks for telling us about it!